I have been quite occupied with other things the last couple of days, so I am late on the ball here. 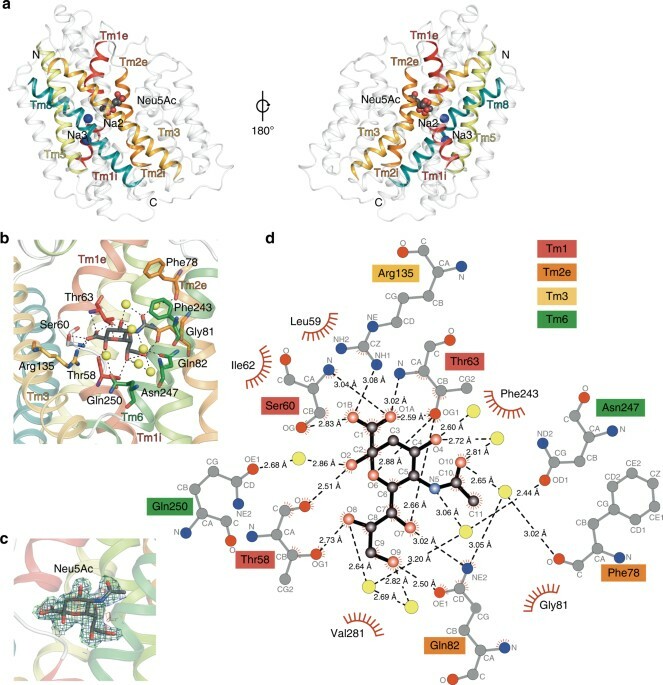 Anyway, on May 1st, Nature Communications published a paper on the protein structure of SiaT, a sialic acid transporter from Proteus mirabilis (1). Many pathogens use sialic acids as an energy source or as an external coating to evade the immune defense (2). Therefore, many bacteria that colonize sialylated environments have transporters which specifically import sialic acids. SiaT is one of those transporters, belonging to the sodium solute symporter (SSS) family (3) (with for some weird reason is associated with the Pfam family “SSF”, an eternal source of confusion in discussions within this project). The SSS proteins use Na+ gradients to drive the import of desired substrates (4). Based on the protein structure, our team found that SiaT binds two Na+ ions. One binds to the conserved, well-known, Na2 site, but the other Na+ binds to a new position, which we term Na3. This position (this is where my part of the work comes in) is conserved in many SSS family members. We finally used functional and molecular dynamics studies to validate the substrate-binding site and demonstrate that both Na+ sites regulate N-acetylneuraminic acid transport. As I hinted, i am not venturing into protein structures – that part of this work has been performed by an excellent team associated with Dr. Rosmarie Friemann. Instead, my part is essentially summarized in these two sentences of the manuscript: “We analysed all SSS sequences that contained the primary Na2 site (21,467) to determine the degree of conservation of the Na3 site, allowing for threonine at either Ser345 or Ser346. Na3 is present in 19.6% (4212) of these sequences including hSGLT1, which transports two Na+, but not vSGLT or hSGLT2, which transport only one Na+” (1). That’s a few months of works condensed into 55 words. Still, the exciting thing here is that we find an evolutionary conserved Na-binding site, which has so far eluded detection. The results of this work provides a better understanding of how secondary active transporters harness additional energy from ion gradients. It may be possible to exploit differences in this mechanism between different SSS family members (and other transporters with the LeuT fold) to develop new antimicrobials, something that is urgently needed in the face of the rapidly increasing antibiotic resistance. Vimr ER, Kalivoda KA, Deszo EL, Steenburgen SM: Diversity of microbial sialic acid metabolism. Microbiology and Molecular Biology Reviews, 68, 132–153 (2004). North RA, Horne CR, Davies JS, Remus DM, Muscroft-Taylor AC, Goyal P, Wahlgren WY, Ramaswamy S, Friemann R, Dobson RCJ: “Just a spoonful of sugar…”: import of sialic acid across bacterial cell membranes. Biophysical Reviews, 10, 219–227 (2017). Severi E, Hosie AH, Hawkhead JA, Thomas GH: Characterization of a novel sialic acid transporter of the sodium solute symporter (SSS) family and in vivo comparison with known bacterial sialic acid transporters. FEMS Microbiology Letters, 304, 47–54 (2010).